Alltech Construction is located in Annandale, MN and serves the entire state of Minnesota. We are a family business, founded in 2003 as a sister company of an 80-year old commercial contractor. 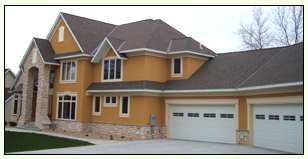 Alltech Construction is a very detail oriented, fast and professional company. We pride ourselves in providing prompt responses and estimates. Our Jobs are completed quickly, and are done correctly the first time. We will do everything we can to keep our jobsite neat and tidy, not only after the project is done but while we work as well. Alltech Construction is your local choice for all of your construction needs. Give us a call today, and let us know how we can help you! Do you have damage to your roof from a storm, melting snow, or leaks. We offer roof inspections, leak detection and repair. We can work with your insurance company so that you don't have to! Contact us for more details. With over 40 years in the industrial roofing industry, our experience is second-to-none. Trust an expert and call Alltech Construction today! We provide a three-year Labor warranty on all jobs. We can also offer the longest Manufacturer's warranty available on all materials that we use. Call us for more details!